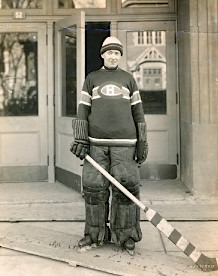 He doesn’t look well but only because he wasn’t: Georges Vézina was one ill goalie in the fall of 1925. That’s when the Montreal photographer S.J. Hayward got him out on a plank outside the Mount Royal Arena to take this photograph, a print of which sold online this month for nearly US$1,000 at RMY Auctions. Vézina was 38 by the time it was taken. The only man to have guarded the Canadiens’ goal since 1910, he had, at this point, just one more regular-season game to play. He won his first Stanley Cup in the old NHA in 1916 and then he won another (in the NHL) in 1924. Between the two leagues, he was the goalie to allow the fewest goals seven times. He was a baker’s son and — this you already knew — his nickname was The Chicoutimi Cucumber. Heading into the new season, Montreal coach (and owner) Léo Dandurand wasn’t sure whether Vézina was going to play. Just in case, he signed Alphonse Lacroix, who’d backed the U.S. Olympic team to a silver medal at the 1924 Chamonix Olympics. On November 12, Vézina sent a telegram that he’d be back. In the week that followed, he played in exhibitions against the Victoria Cougars, the reigning Stanley Cup champions from the Western Canada Hockey League. And when the season started on November 28, he was in the Montreal net for the opening game against Pittsburgh’s mighty Pirates. Steered by Odie Cleghorn, their right wing/coach, with Roy Worters in goal, the Pirates ended up winning the game, 1-0, on a goal by Tex White. Montreal’s line-up featured Howie Morenz, Aurèle Joliat, and Billy Coutu. The Pittsburgh Press carried a lively narrative of the game next day, in which Morenz featured both for storming offense and pugnacity. In the first period, he took a penalty for “bumping” while in the second he had “a fist fight in the corner” with Jesse Spring. Lacroix was in the nets for [sic] Canadians at start of second period. Vézina was reported ill. 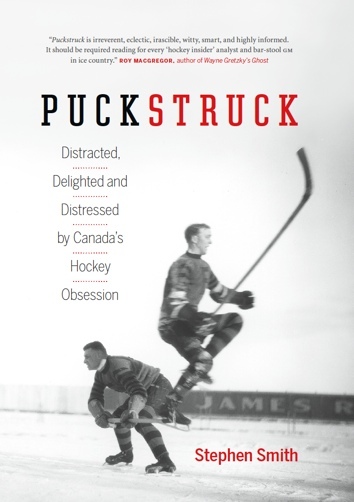 But the high spot of the evening for the Canadien supporters came at the beginning of the second period when Lacroix, former United States Olympic goalkeeper went into the Canadien goal in place of Georges Vézina. The veteran goalkeeper started the game with a high temperature. He was pale and haggard looking as he turned shots aside in the first period. At the rest interval it was decided to replace him and for the first time since he took up hockey eighteen years ago, the veteran goalkeeper was forced to drop out of play. He remained in the dressing room with only his pads off hoping to pick up a little and get back into the game. But he was not in condition and with Lacroix well settled in the play, the former amateur was left in to the last. A few days earlier, The Gazette had reported that Vézina was suffering from “a severe cold;” now he was diagnosed with tuberculosis. He was soon home in Chicoutimi. Within four months, before the end of March of 1926, just 39, he was dead.